The Pocketalker Ultra 2.o is the latest in the very popular Pocketalker series of handheld hearing amplifiers. These types of amplifiers are perfect for anyone who doesn’t like to wear in-ear devices or for those who need a boost for their hearing aids. This model has a built in T-coil for better hearing in ADA-compliant venues. It also has an adjustable tone, as well as new balance control. Like previous versions of the Pocketalker, the Pocketalker Ultra 2.0 is a fantastic device for people with mild to moderate hearing loss, who need a hearing boost in certain situations like 1-on-1 conversations, TV listening, small groups. It also works really well for users in in nursing homes and assisted living facilities to help communicate with staff and other residents. It is designed to be easy for anyone to use, all you need to do is point the microphone near what you want to hear, put on the headphones and then you will be able to hear more clearly. The price has gone up slightly for this model, but with the extra cost comes many new and improved features. The obvious difference between this version and previous versions of the Pocketalker is the sleek, modern design. Now it is white rather than silver with more of a high tech look to it. It is lighter and much thinner; making is easy to carry around with you and to hold. Pocketalker has also corrected some of the problems they had with earlier designs, specifically they have extended the high and low frequency range, making the sound much clearer and easier to customize. They have also added an internal microphone and added a new built in t-coil. The t-coil is a great new feature that when switched to the ON position, the microphone becomes disabled and the device picks up the signal in the looped environment (churches, meetings). Another big new feature that Williams Sound has added, is the ability to be rechargeable ready, which just means that they added a charging port to the device that you can use with a rechargeable battery kit (sold separately). They have also added a new balance control, which was sorely lacking in older models. This allows the user to adjust the volume as needed between the right and the left headphone. Many of the new features have helped a great deal with overall sound quality. 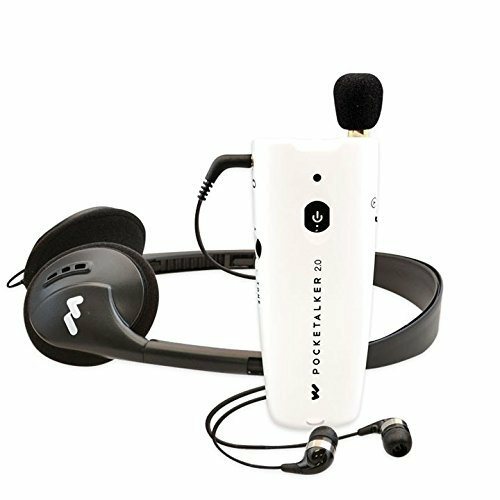 Since this unit includes both an internal and plug-in microphone, you have more control over customizing the sound for the various situations as it may be needed. The output balance control is a nice feature for those who have different levels of hearing loss in each ear. The tone control is very important to the overall sound quality and makes the biggest difference over how well you will be in your listening environment. All of these different controls are easy to use and are uncomplicated, even for those who have vision issue or who have difficultly using smaller devices. The PKT2.0 can be used with mono or stereo headphones so now you can use the type of headphones, earbuds, or neckloops that you find most comfortable. The Pocketalker Ultra 2.0 looks nothing like it predessors, it has a much more modern and sleek design In addition, the microphone is located internally so the microphone no longer protrudes from the top. The PKT2.0 does have an external microphone port that will accommodate a plug-in mount microphone (included in packaging) although it does not have to be plugged in to use the device. Overall it is a much smaller, lighter and more portable device than previous models. The Pocketalker Ultra 2.o has a battery life of up to 105 hours of use with 2 AAA batteries. You also have the option to use regular rechargeable batteries or purchase a Rechargeable Battery Kit (sold separately) that uses a USB port for charging AAA rechargeable batteries. This means that if you purchase the separate battery recharging kit, you can recharge the battery without having to take them out of the battery compartment. The Pocketalker 2.0 personal amplifier has an amplification level of up to 63dB amplification, which is an upgrade from the Pocketalker Ultra that has a 50dB amplification. A 63db amplification boost is very high for a hand-held device and I believe is one of the highest on the market for this style of amplifier. Who would benefit from this device? The previous Pocketalker’s had the ability to customize the sound to a limited degree. The PTK2.0 allows for a bit more customization, due to the new balance control along with the already existing features of tone and volume control. The increased amplification level of up to 63 dBs also is a big improvement for people with more severe hearing loss. You can’t beat the warranty for the PKT2.0, it is 5 years for parts and labor and 90 days on accessories. 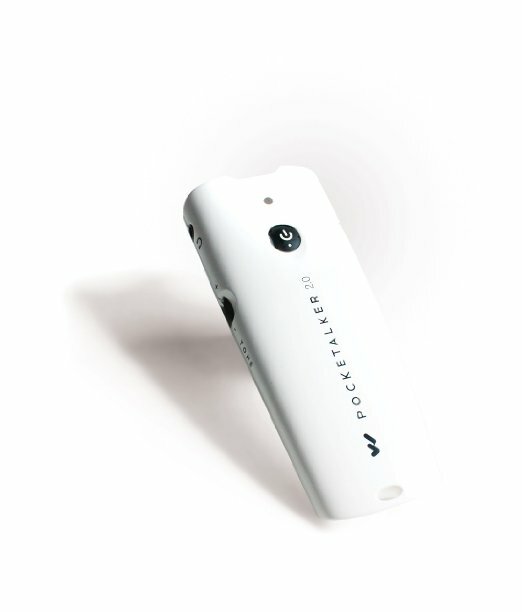 The Pocketalker Ultra 2.0 is available through online retailers for a cost of approximately $189. There are various accessories that you can add to the base version. Generally the basic version comes with dual earbuds, headphone that can fold, microphone, 12″ TV amplifying extension cord, 2 AAA batteries, belt clip and lanyard.